We’re reaching peak locavore season on Martha’s Vineyard, where in August you can assemble a complete meal of Island ingredients: corn, tomatoes, greens and colorful vegetables, freshly-caught fish and for dessert, melons or blueberries. Now you can add Island-grown bread to the menu. Beach Road restaurant in Vineyard Haven opens its front room daily at 2 p.m. to sell baker Leslie Hewson’s sourdough loaves, along with challah and brioche, for $4 to $8 a piece (plus tax). 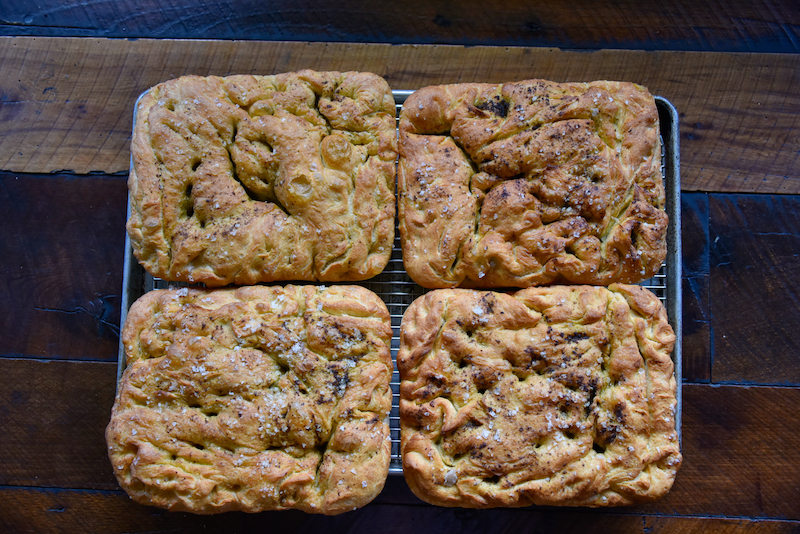 These are the same house-baked breads available inside the restaurant at dinnertime, made with natural sourdough from local grains. 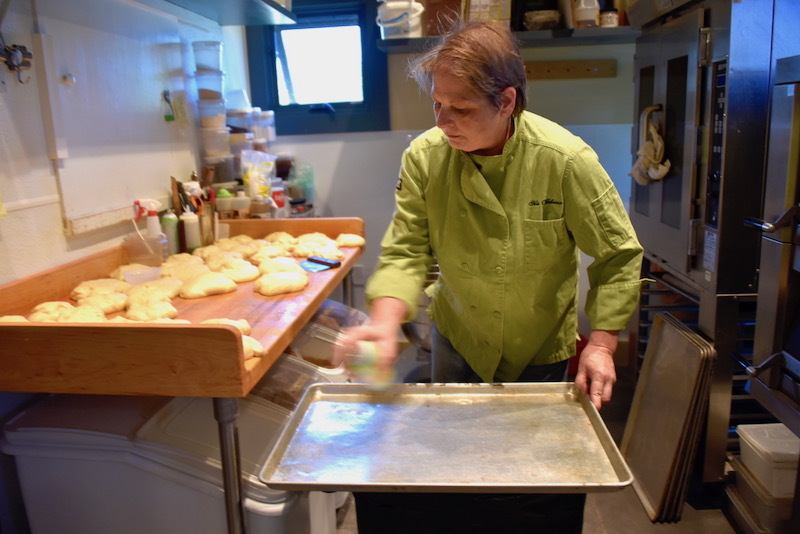 “Wild yeast—it’s very cool,” says Leslie, who bakes all the breads for sister restaurant State Road in West Tisbury as well. About three years ago, she started the culture that lifts and flavors her French-style sourdough loaves. The original ingredients were flour from locally-grown rye, some Island apple and water. Once the starter was good and lively with airborne bacteria from the Vineyard atmosphere, Leslie started feeding it daily with Island-grown red fife wheat from Dan Sternbach’s Lost & Found Grain of West Tisbury. At the Beach Road bakery, she now adds about 1,000 grams a day to her sourdough culture. 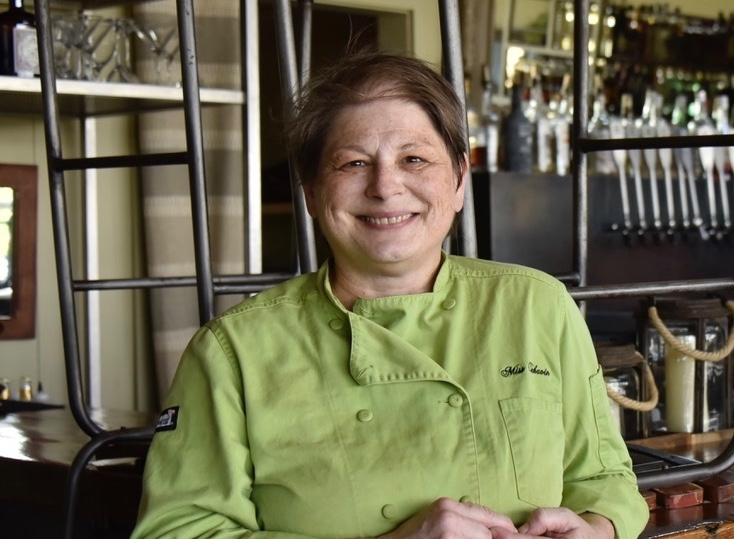 A lifelong cook and former restaurateur, Leslie learned to make artisan bread from the famed Jeffrey Hamelman, with whom she studied at the King Arthur Flour teaching facility in Vermont. Despite having cooked in the restaurant business since her teens, “I never thought I’d make bread, because it was so difficult for me,” she said. To become the accomplished baker she is today, Leslie had to shift her expectations as a chef. Bread dough, alive with countless microorganisms, doesn’t submit to handling the same way harvested foods do. Air temperature and humidity are just two of the elements Leslie considers when she arrives at the bakery around 5:30 a.m. The temperature of the flour and the water and even the friction caused by the mixing machine all have to be taken into account. When it comes to ingredients, Leslie is a firm believer in King Arthur unbleached flour. “Unbleached product is why the bread inside looks the way it does: It is not white, it’s creamy. There are no conditioners (added ingredients),” she says. With just three ingredients—flour, water and starter—Leslie’s loaves are as clean as bread can be. She now turns out about three dozen a day at Beach Road, where she also makes all the special cakes. And the chef who never thought she’d be a baker is now thinking about teaching a bread-baking class of her own, so others can conquer the “mountain” she scaled. “I’m glad I stuck with it,” Leslie says.